The islands of Thailand are very famous among tourists around the world. The beaches are clean and beautiful. The islands of Thailand will also provide opportunities for recreation, spiritual exploration, and relaxation. There are more than 100 islands in the country so it’s quite difficult to decide which islands you should visit when you are planning a trip to the country. So, here we are listing for beautiful and fascinating islands in Thailand to visit. The island group contains six beautiful islands located in Krabi Province in Southern Thailand. The six islands are Ko Phi Phi Don, Ko Phi Phi Lee, Koh Yung, Koi Mai Phai, Koh Pai and Ko Bida Nok. The island has been severely struck by the Tsunami in December 2004. The island infrastructure has been destroyed. Now redevelopment work has been completed but there few rules that are implemented on the height of hotels in order to preserve the beauty of the island. Out of the six islands in the group, Koh Phi Phi Don Island is the largest along with beautiful beaches and stunning cliffs. The Ko Phi Phi Leh island is famous as it is the filming location of the 2000 movie named “The Beach”. Florida beaches also famous among tourist for their clean sand beaches. The island is basically famous for recreational purposes like scuba diving, rock climbing, and hiking. There are around 7000 new divers get certified on this island every year thus making the island most famous among the people who want to learn diving. The island is also famous among fishing enthusiasts. There are many resorts, bars and nightclubs have been opened in order to tackle the exploding tourist population of the island. Read about few important things known to us about Bora Bora Islands. The island is also located in the Krabi province of Thailand and it is known for its long white sandy beaches, tropical forests, festivals and food. The island is also famous among tourists who love scuba diving and snorkelling. The scuba divers can enjoy the beautiful marine life with around 100 different types of fishes and nearly 200 types of corals. The elephant trekking in the Ko Lanta National Park will be a lifetime experience. The water of the island is very clean and the white and adds a different beauty to the island. The island has also proper accommodations and restaurants for the tourist. Islands in Greece is also known among tourist for their natural beauty. The island is located near the border with Cambodia. The island is also the third largest island in Thailand. The mountains surrounding the island along with waterfalls and thriving coral reefs make the landscape of the island very beautiful. The white sandy beaches and rainforests also add beauty to the island. Due to its fascinating beauty, the island is very famous among the visitors though it is far than many islands of the country. The island has proper resorts and hotels for the tourists. Thailand is also as best nightlife cities of the world. The island is located in the in the Gulf of Thailand. It is famous for the delicious food and shopping opportunities. The island’s clear blue water and the fine sands add beauty to the island. There are many beaches that are famous on the island namely Chaweng beach, Lamai Beach, Bophut beach and Maenam beach. The resorts have a world-class facility with a proper view of island and sunset that will give you a lifetime experience. There is also a Big Buddha temple situated on the Northern coast of the island and its acts as a landmark for Ko Samui. The visitors can also take a jeep tour to the forests of Ko Samui and can enjoy the stunning view of a forest, valleys, rivers and small waterfalls. It is famous for the visitors as one of the most beautiful islands in Thailand. You must also know about a few magnificent Caribbean Islands. Phuket is a name given to rain forested mountainous island in the Andaman Sea. The province has Thailand’s most beautiful beaches that are situated along the clear waters of the western shore. Phuket is the most popular tourist spots in the country outside of Bangkok. The beaches are clean and also have proper accommodation facility for the visitors. There are many things that you can enjoy on the islands like golf courses, historical museums, and monuments. You also need to know about largest islands in the world. The island is located in the eastern part of Thailand. The name Ko Tao means Turtle Island. The island is small and it has a shape of a turtle and thus the name. The island is also very famous among the tourist who wants to learn diving. There are more than 20 diving spots on this island. The boat riding activity on the island is one of the fascinating things you will do here and will be a memorable experience. There are both traditional boats and smaller boats are available on all the beaches of the island. Are we consider the landscape beauty it is one of the most beautiful islands in Thailand to visit. Cities of Thailand also listed under best beach cities in the world. 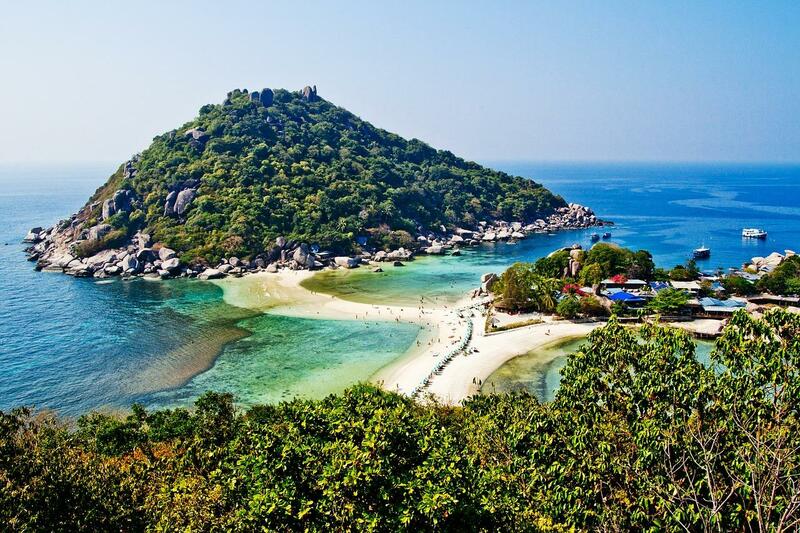 The island is located in between the islands of Ko Samui and Ko Tao. It is surrounded by beautiful rainforest and beaches. It is famous for visitors who want less crowded beaches along with peace. The island organizes an electronic dance festival known named Full Moon Party every year. The island has proper resorts for tourists. The island is located in the Satun province of Southern Thailand. The island is very small but it’s very beautiful in its own landscape. There are three beaches on the island Pattaya Beach, Sunrise Beach and Sunset Beach. The water of the beach is very clear and has a striking blue colour making it one of the most beautiful islands in Thailand. The island also offers diving and snorkelling options to the visitors. It has shallow waters which is very much helpful for the beginners who want to learn diving or swimming safely. The island has many bars, restaurants, and places where you can dance. The nightlife of the island is very beautiful. It is also a small island located in the Rayong province of Thailand. The island is very famous for its beautiful Sunset and fascinating beaches. The beaches of the island have exceptionally clear blue water with white sandy beaches that make it even more beautiful. The temperature of the island remains pleasant throughout the year. The nightlife of the beach is also good with many bars and restaurants. The visitors can also enjoy diving, snorkelling, swimming, boating, fishing, and windsurfing. It is of the most beautiful islands in Thailand to visit.